I met Tobgay today. He’s nine years old and has just completed Class II in Dechechencholing MSS. He was rummaging through my negibour’s waste. In fact, Tobgay was recycling garbage. He was collecting various tins and bottles, and plastics and metals to sell to a scrap dealer in town. His part-time work would fetch him Nu 5 per kg for iron, steel and certain plastics; Nu 1 for every beer bottle; and Nu 30 per kg for aluminum cans. That’s easy money, he confided, because there’s always plenty of recyclable garbage. Yesterday he and his friends earned Nu 130. They spent most of that money playing video games and eating. But today he plans to be a bit more cautious – he wants to buy a pair of jeans. 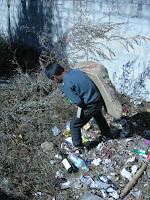 Thimphu’s garbage is screaming for better waste management. And the message is loud and clear: reduce, reuse, and recycle – we can’t afford not to! wow! Thanks for sharing this amazing story with us. There is lesson to be learned here. With solution like these, there is definately hope for making Thimphu to cleanist city. Are we saying that it’s ok to see a Class II completed child rummage through waste? Should we not be concerned? What about ‘Child Rights’? Are we not getting carried away by political correctness? let’s be more human, man ………. Great story which brings into attention the pressing issue of the urban solid waste management. We are perhaps generating more wastes than we can dipose effectively. While I really feel for the likes of the boy Tobgay who need to make some pocket money, I feel there should be a more systematic way of dealing with such wastes. For instance, we can have a centralised materials recovery facility which is essentially a large hall where wastes are sorted (after collection from the homes) for any recyclables, while the non-recyclables can then be transported to the landfills. This can save space at the landfill and at the same time promote recycling and generate part time jobs for so many Tobgays. Occupational health and safety standards are also easier to enforce in such workplaces. Our relevant agencies should really take a more proactive role in addressing this issue urgently. The sooner the better. its so sad to here that but Thimphu is becoming a city of big chalange .is his parents no so huch concins about that what he is doing.